Since the days of Sputnik and Explorer 1, thousands of spacecraft have gone into space, some of them carrying human passengers. The first person to orbit the Earth was the Russian Yuri Gagarin, on April 12, 1961. The first American to do so was John Glenn, who completed three orbits on February 20, 1962; more than 26 years later, at age 77, Glenn returned to space aboard the space shuttle. 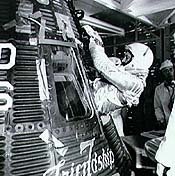 Glenn's flight was the first in "Project Mercury" which adapted the Atlas missile. It was followed (in the US) by "Gemini" whose two-man capsules were orbited by the more powerful Titan rocket. Then came the three-man "Apollo" missions, first flying around the Moon and then landing on its surface, on July 20, 1969. Altogether 6 successful landings on the moon were achieved, all using the giant (2700 ton) Saturn V rocket, powered by five huge F-1 rocket engines (and one more on the second stage). One such engine is displayed in the National Air and Space Museum (NASM) of the Smithsonian Institution in Washington, as is John Glenn's capsule, a Moon lander and many other mementos from the early days of spaceflight. The story of manned spaceflight is fascinating and long, it is still unfolding and this short account cannot possibly do it justice (nor does it cover manned spaceflight on Russian and Chinese rockets). For many years the US spaceflight program relied on the space shuttle, a reusable rocket vehicle with short wings, which allowed it to land on a runway like an airplane. The shuttle's rockets used about 700 tons of liquid hydrogen and oxygen, a most effective fuel; in addition it carried two strap-on solid fuel rockets, each weighing about 600 tons. Manned satellites include various "space stations" intended for long-term residence. In the past, the US flew "Skylab," launched in 1973 and burned up in its atmospheric re-entry in 1980, long after its last occupants had left; a backup Skylab module is open to visitors at the NASM. The USSR launched space-stations of gradually increasing size, the Soyuz, Salyut and (in 1986) the Mir space station (on right). Over the years Mir was extended by additional modules (one of which was damaged by an accidental collision in 1997) and was still operating in 2000. It finally re-entered the atmosphere on 23 March 2001, near the Fiji islands in the Pacific Ocean. Its re-entry was observed from the ground and fragments which did not burn up splashed harmlessly into the ocean. Construction of the International Space Station began in November 1998 with the placing in orbit of the Russian module "Zarya", followed in December by NASA's "Unity." As of the end of 2000, a US-Russian crew is stationed aboard it. built 1102 and restored recently. Any manned mission faces the problem of safe return to Earth, which requires getting rid of the huge amount of energy associated with orbital motion. A spacecraft in low Earth orbit moves at about 24 times the velocity of sound. Since the energy of motion ("kinetic energy") is proportional to the square of the velocity v, gram for gram (or ounce for ounce) such a spacecraft carries 242 = 576 times more energy than an object moving at the velocity of sound (in air), e.g. a typical pistol bullet. Atmospheric friction converts this energy into heat, enough heat than to melt or even evaporate the re-entering material, even if it is a tough metal. To get rid of this heat, the vehicle re-enters the atmosphere at a shallow angle, stretching out the time spent in the more rarefied upper layers. It is also useful to present a blunt obstacle to the air, creating a strong shock front well ahead of the reentry vehicle, which dissipates much of the heat. For this reason the space shuttle starts re-entering the atmosphere bottom-first, and only after almost all its velocity is lost does it turn around to the nose-first attitude of an airplane. Still, a great amount of heat reaches the spacecraft, requiring its forward-facing part to be lined with heat-resistant material. Mercury, Gemini and Apollo used shields which gradually wore down (ablated), sparing the spacecraft which then landed by parachute. The shuttle's bottom was lined with lightweight heat-resistant tiles of a special material. The Soviet Union built and in 1988 flew its own space shuttle, the Buran, but though its tests were successful, it was not used afterwards. 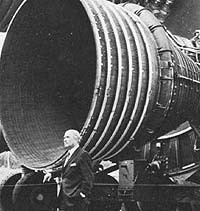 Picture on right: Wernher Von Braun and one of the F-1 rocket engines, the type that powered the Apollo moonflights. Such an engine is on display at the national Air and Space Museum of the Smithsonian, in Washington, DC. So great is the variety of unmanned spacecraft that even more than manned spaceflight, it is impossible to cover all of them here. 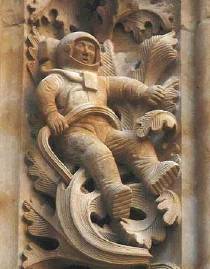 The sites below date back to 2002-4, when they were first incorporated in "From Stargazers to Starships." While expanded, do NOT cover later years in comparable detail; many sites originally listed are gone, and were replaced by links to Wikipedia. Satellites that observe the Sun, the solar system or the universe (such as the Japanese Yohkoh which observes the Sun, or the Hubble orbiting telescope). Orbiting observatories can cover wavelengths which the atmosphere does not let pass through, such as ultra-violet light or X-rays. Satellites which observe the Earth from above, for scientific, military and commercial purposes--such as the ones providing the global pictures of cloud patterns, shown in weather reports on TV. Satellites which sample their local environment, for instance, the ones that monitor the radiation belts and the solar wind. Satellites used for the benefit of humanity, such as communication satellites and the GPS system used in determining position. Spacecraft which are not tied to Earth, but explore other planets and the far reaches of the solar system. Elon Musk, a visionary engineer, set out to build a new reliable low-cost rocket launcher. He founded the Space-X corporation which developed, stage by stage, the Merlin rocket engine, the Falcon rocket using it and later the 300+ ton Falcon 9 rocket which used a cluster of 9 Merlins. Falcon 9 was successfully launched into orbit on June 4, 2010, and a second launch was carried out late on December 7, 2010 and included the "Dragon" upper stage, which returned to Earth behind a protecting heat shield in the morning hours of December 8. Details of later flights by "Falcon 9" will not be covered here, except to note that it was also the rocket which successfully pioneered the retrieval of first-stage rockets after launch. A book on Yuri Gagarin: "Starman: The Truth Behind the Legend of Yuri Gagarin" by Jean Doran and Piers Bizony, Bloomsbury (Great Britain) 1998. Questions from Users: Is a heat shield needed while going up? Also: *** Why is the path of reentry from space so critical?. *** How do Rockets Land? Next Stop after the ones cited above: #30 Far-out Pathways to Space: Great Guns?